Hello! Yes, I'm here. My blogging will be rather sporadic for the next few weeks while I deal with university assignments and other things on my 'To Do' list. One of those 'To Do' was to send the invites in the mail for my WH's 40th birthday. Gosh that sounds old, doesn't it!! 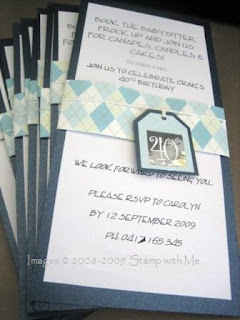 He certainly didn't want a fuss made, so I had to make some invites that weren't over-the-top or 'fussy'! I think he'll like these. Unbelievably, there is not stamping! Just sticking, tying and punching!! I went to the local art store where they have a marvellous selection of cards, papers and envelopes for DIY invitations. I picked metallic navies, blue prints and silver stickers. I think I now have the colour theme for the actual night and decorations! Cool, huh! And you should see the menu .... I'll leave that for another day though, as I haven't finalised that with the caterers yet. It's lucky we have the tax refund money coming through!! So tata for now. Matthew has just woken up from his sleep and needs lunch! !